We offer private and group ocean kayak lessons for people who want to learn how to surf kayak, or as we call it, sedentary shredding. Helmets, life jackets, surf kayaks and paddles provided. The instructor will enlighten you on the dynamic ocean environment, paddling techniques, judging and catching waves and paddle bracing. 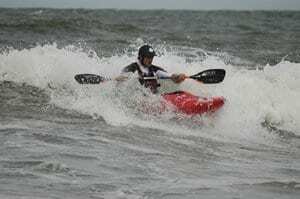 Your instructor knows the best sand bars for beginner and intermediate surf kayaking.